By looking at the small-screen picture...[Brooks] provocatively suggests that America's socio-political problems are pretty much the same as the personal problems of its citizens. 133 min. 20th Century Fox. Director: James L. Brooks. Cast: William Hurt, Holly Hunter, Albert Brooks, Robert Prosky, Lois Chiles. A few years ago, John Updike wrote, "Certainly, speech patterns and thought patterns and social habits, not to mention the physical accoutrements of daily existence, have greatly changed in the half-century or more since I received my basic impressions of life in America. Yet for truth I still have my humanity and the stretch of history my lengthening life includes." Though it's aged into something of a time capsule, James L. Brooks' 1987 comedy-drama Broadcast News still has its humanity. It also has history to testify to its truth. First and foremost, writer-director-producer Brooks' knack for humane, character-driven comedy has served him well in television (as co-creator of The Mary Tyler Moore Show and Taxi and co-developer of The Simpsons) and on the big screen (his feature-film debut Terms of Endearment having won him three Oscars in 1983), and Broadcast News excels in this emotional sensitivity. Meanwhile, the film allowed Brooks to delve once more into that titular world that had fascinated him for years, spanning from some of his earliest professional experience writing for CBS News to the newsroom settings of The Mary Tyler Moore Show and its relatively sober spin-off Lou Grant to the fresh research that grounded Broadcast News. In the same year that saw her breakout work in Raising Arizona, Holly Hunter brilliantly embodies Atlanta-bred network-news producer Jane Craig. The firecracker talent of the Washington bureau, she has earned the love of her boss (Robert Prosky), the respect of the national anchor (Jack Nicholson, in a surgically effective plus-size cameo), and the frustration of executives. An executive acidly answers one of Jane's righteous tirades: "It must be nice to always believe you know better, to always think you're the smartest person in the room." "No," she replies. "It's awful." Lest we doubt her, Brooks gives us brief glimpses of Jane in private, allowing herself to bawl for less time than others allot for a smoke break. Then it's back to work as a whip-smart, blazingly efficient, aggressively protective guardian of the hopelessly retreating front line of intelligent news dissemination. Mitigating Jane's personal loneliness and salving her professional frustrations is her colleague and Pulitzer Prize-winning reporter Aaron Altman (Albert Brooks, great in a tailor-made part), to whom she returns the favors. Seemingly, they're a match made in heaven, though Aaron's nebbishy self-deflation and near-certainty of rejection have kept him pacing "the friend zone" in wait. Into this comfortable truce comes rising on-camera star Tom Grunick (William Hurt), sent to Washington to soak up experience as watchful execs breed him for bigger things. Where Aaron has always made his way with smarts, Tom has coasted on his looks and the natural confidence that comes with them; the grass is greener, as they say, for both men. Tom laments his lack of smarts, while Aaron yearns to show the poised image that could place him behind the anchor desk. The two initially tolerate each other's presence in the same bureau, but when Tom sparks to Jane, the point is pressed between her and Aaron—hence, a love triangle that's a bit obtuse and a bit acute (sure, it doesn't add up, but call it The New Math...). These are parts that might have been played by Katherine Hepburn, Spencer Tracy, and Jimmy Stewart in their heyday, and Brooks serves as something of a latter-day Capra, with the memorable dialogue to match. Broadcast News doesn't have the canines of Paddy Chayevsky's biting TV satire Network, but Brooks does a fine job of recreating the mise-en-scène of network news, and he's plain enough about its slipping standards, superficiality (learned from human nature), and lack of loyalty to its employees. By taking a journalistic tack with people like CBS News producer Susan Zirinsky, Brooks captures without condescension the difficulties of a principled producer and a working woman in what was still a man's world (Zirinsky herself confessed to Hunter's funny-sad crying jags). The dichotomy of Aaron and Tom says a lot about American culture's preference for style over substance and its magnetic attraction to pleasing surfaces; part of the authenticity to Aaron's hurt must come from Brooks' implicit insecurity as a Jew in a town that defaults to gentile stars. Broadcast News famously refuses to cop out with a conventional romantic-comedy ending, one reason the film fits comfortably in the Woody Allen school. With the help of three never-better actors, Brooks locates where heart meets head; there, he referees relatable struggles of relationships, career, personal morality, and our own worst enemies. By looking at the small-screen picture, he also provocatively suggests that America's socio-political problems are pretty much the same as the personal problems of its citizens. 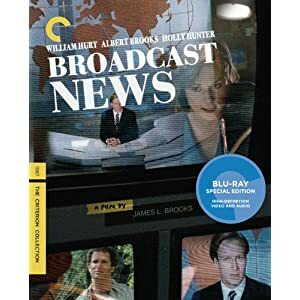 It's great to see Broadcast News in the hands of the Criterion Collection for its Blu-ray debut. Never a title that has come with anything to speak of in the category of bonus features, the film finally gets a special edition with some meat on its bones, along with a fantastic hi-def A/V transfer. Because of its '80s vintage and its low-key visual scheme, Broadcast News is not the kind of picture one expects to leap off the screen, but longtime fans of the film will immediately recognize how well the film has been treated here. The transfer comes "supervised and approved by director James L. Brooks and editor Richard Marks," and it looks it, with light grain retaining the film-like appearance, accurately muted colors, and excellent detail, with no sign of digital artifacts. It's such a pleasure to see a film rescued like this; after years of lackluster presentations, this one's the real deal. Broadcast News also comes with a definitive DTS-HD Master Audio 2.0 track that's winningly clean and clear. First among the extras is a 2010 commentary by writer-director-producer James L. Brooks and film editor Richard Marks. Amiable and nostalgic, the track finds the two catching up with the film after many years, though they keep up a steady stream of information and perspective on what we're seeing. Also newly minted is the documentary “James L. Brooks—A Singular Vision” (36:06, HD), a career overview constructed of interview clips with composer Hans Zimmer, Marilu Henner, Julie Kavner, writer/producer Al Jean, critic Ken Tucker, ICM chairman and CEO Jeffrey Berg, and filmmaker Wes Anderson. There's a special attention given to Brooks' interest in network news, as reflected in The Mary Tyler Moore Show. “Deleted Scenes” (19:28, HD). The former captures a largely improvised scene between Hurt and Hunter (one that would have been a more conventional ending), while the latter mostly details the subplot—only alluded to in the finished film—about Hurt's source. The alternate ending comes with Brooks commentary that frames the scene. “Susan Zirinsky” (17:02, HD) is a fascinating sit-down with veteran CBS News producer Susan Zirinsky, the inspiration for Hunter's character. Frank and revealing, Zirinsky gives a strong sense of Brooks' desire for realism and what she was able to offer the production; she also shares some stories about her personal life and professional career. The original studio-produced EPK “Featurette” (7:56, HD) is also here, including interview snippets with Brooks, Hunter, and Albert Brooks, though far more interesting is “Interviews and On-Set Footage” (18:38, HD), effectively the source material from which the featurette was edited (seeing Brooks and Brooks interviewed together is a hoot). Last up is the film's “Trailer” (2:18, HD). Of course, the package also includes a 16-page color booklet with photos, tech specs, credits and liner notes by film critic Carrie Rickey. All site content © 2000-2019 Peter Canavese. Page generated at 04/18/2019 01:24:57AM.